"My version of one of our favorite ways to reuse smoked pulled pork. 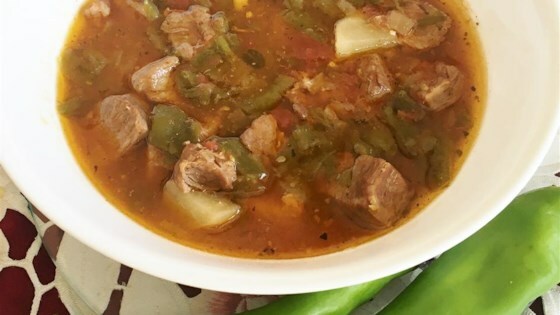 Feel free to use canned green chiles and cooked meat of your choice. Garnish with queso fresco, cilantro, and lime." Heat oil in a large pot or Dutch oven over medium heat. Add onion and carrot; cook and stir until almost soft, about 5 minutes. Add chile peppers and garlic; cook and stir until fragrant, about 2 minutes. Season with salt and black pepper. Stir in pork and all-purpose flour. Stir chicken broth slowly into the pot. Add tomatoes, potatoes, and cumin. Bring to a boil; reduce heat and cover. Simmer, stirring occasionally, until potatoes are tender, 20 to 25 minutes. Check peppers for heat and adjust for taste. Very nice stew, if you like chili you're going to like this stew. adds great flavor to an otherwise( I find pork to be a) bland meat.